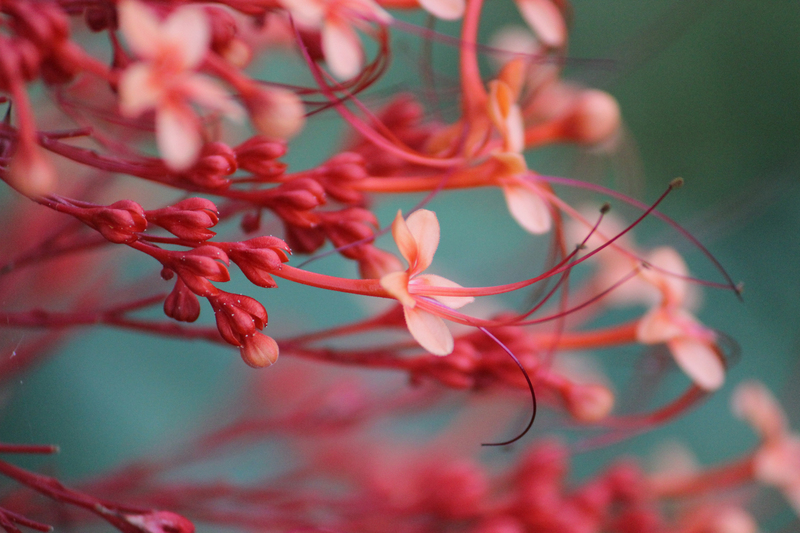 Salt Springs, FL: There are these amazing flowers here, at Amrit Yoga Institute called Pagoda flowers. And that’s exactly what they look like. Tiers of little pinkish red flowers one on top of the other. They rise to about six feet and attract copious amounts of butterflies from tiny and bright yellow to giant, graceful swallowtails. Hidden in the large green leaves beneath these magical structures are dragonflies, tiny spiders, something brown and black that may or may not sting. It’s a whirlwind of activity. But as I tried to train my camera on the moving butterflies all I came up with were colorful little blurs. So I chose just one flower on which to rest my attention . This is the result.